The Story of Holly and Ivy is a short story, which has been published in both chapter book and picture book formats. This edition is the original from 1958 and includes charming red and green line drawings by Adrienne Adams. As the author states on the very first page, the story is about wishing. Holly, a Christmas doll on sale at the toy shop wishes a girl would take her home and play with her. Ivy, an orphan who has run away, wishes to find someone with a Christmas tree and no children to be her grandmother. Mrs. Jones and her police officer husband wish for a little girl with whom to spend the Christmas holiday. Through a series of unlikely events, all three wishes manage to come true, resulting in a very Merry Christmas for all. Though the happy ending is an obvious given from the outset, Godden makes the wait for the resolution worthwhile. 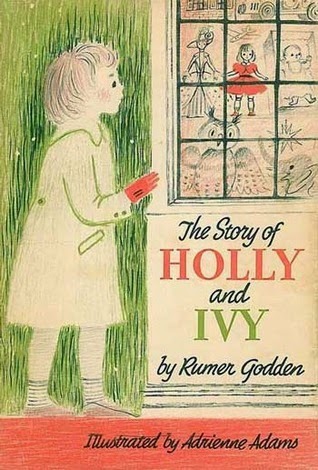 Her descriptions of the toys in the toy shop (especially the creepy and cruel owl, Abracadabra), the details of Ivy's experience at the orphanage, where she is the only child not taken into a family home for the holidays, and the conversation the Joneses have about whether to decorate for Christmas all paint vivid pictures of the needs of each character. The reader, therefore, does not root for just one character, but for the Christmas miracle that will fulfill each of their desires. Some books about such Christmas miracles seem insincere or maudlin, but this one resists becoming overly melodramatic, and is instead very matter-of-fact in its telling of unlikely events. The real reason to read this book is not to find out how it ends, but to see how skillfully Godden brings the reader to the only possible conclusion.